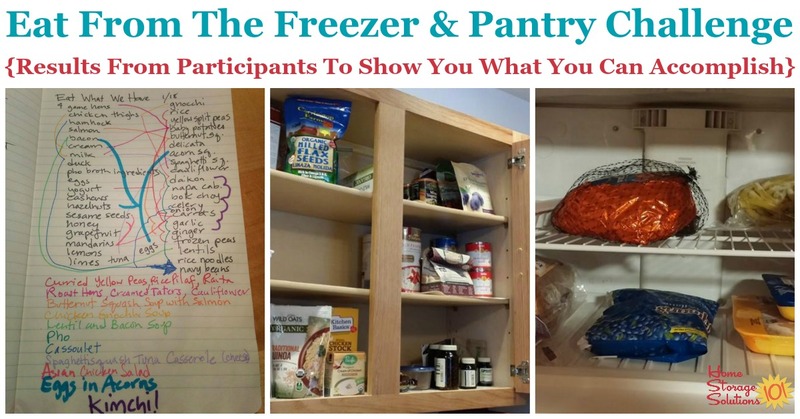 Here are results from participants of the Eat From The Freezer & Pantry Challenge, showing how they emptied and decluttered their freezers, cupboards and pantries, and in the process also saved money and reduced food waste in their homes. 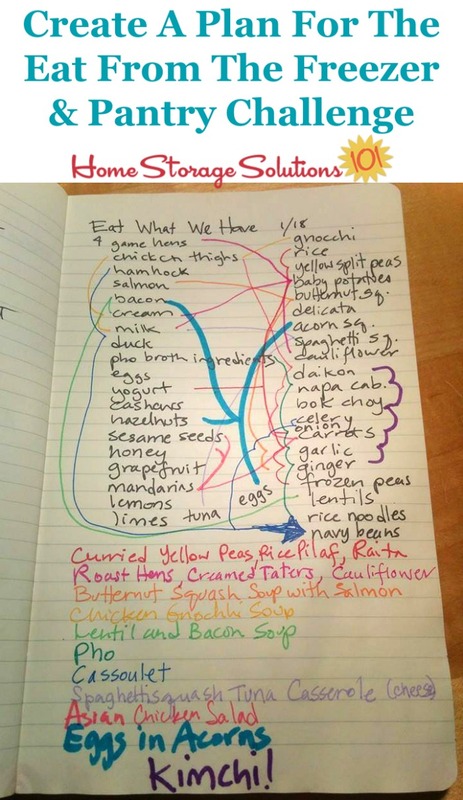 As we work through the parts of the 52 Week Organized Home Challenge here on the site, where we declutter and organize the food storage areas in your home, including the pantry, refrigerator and freezer, it makes sense to do an Eat From The Pantry & Freezer Challenge. As I explain more on the Challenge page here on the site, this simple challenge allows you to accomplish several goals at once. 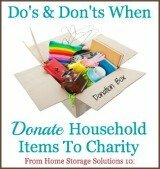 Not only will it help you declutter and them more easily organize these areas, by removing older food from them, you save money by having to spend less at the grocery store for a few weeks as you eat the food you already have purchased, and helps you make sure that food you've got doesn't expire or get too old to eat. Lots of readers have taken on this challenge that we do every single year (some people like to do it twice a year), and to get you enthused to take it on yourself I've created this "Hall of Fame" type page to show off the results others have already had when doing it. 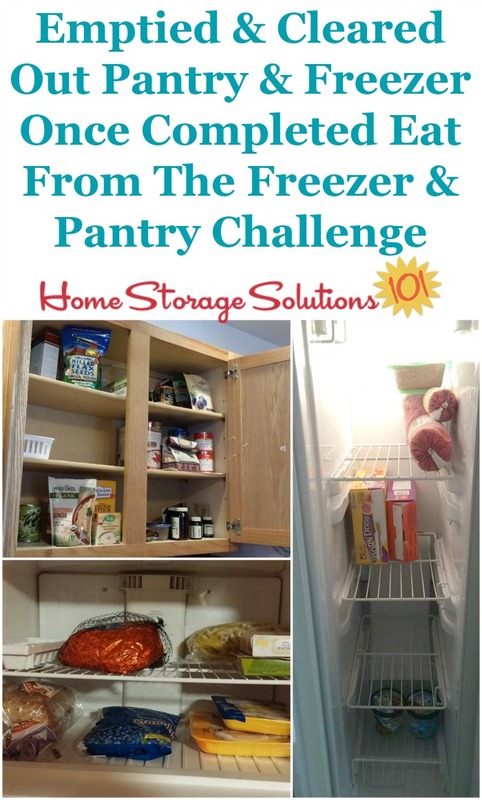 This also shows you how simple the challenge is, and I've got pictures from readers of each of the steps you'll need to take when you do this Freezer & Pantry Challenge for yourself. The first step in the Eat from the Freezer & Pantry Challenge is to look at what you've got currently in your own food storage areas in your home, and make a plan for how to use the ingredients for various meals and dishes. That's exactly what a reader, Chris, did in the photo below. Chris explained, "I wrote down some of the frozen meat, fresh veggies, fruit, and dairy, and dry goods we have (there's a lot more dry goods and frozen, this was just off the top of my head). Then, I came up with meal ideas using those ingredients. The only item I need to buy is some cheddar cheese! Once you've made your plan, go ahead and "shop" from your own pantry and freezer, to gather all the ingredients you need to make that meal or dish. As always, if you need one or two ingredients to complete the meal, you can get those from the store, but the idea is to use up as much stuff as you can. The top photo in this collage above is from Angela, who explained, "All from the pantry and whole chicken from freezer." The bottom photo in this collage is from Jen, who said, "here is a start on shopping from pantry. Dinner for next 3 nights, with leftover chicken from my fridge, and, hopefully some other meat from freezer." There's a large variety of meals you can make with the contents of your freezer and your pantry. Here's some examples of meals made by participants, as they shopped for ingredients in their pantry and freezer. Barbara: "We had this! The shrimp had been in the freezer for quite awhile." Amy: "Ham and Bean soup. It's going to be the warmest it has been in weeks, so it figured I would have this on the menu :)"
Heather: "I made this last night. Ham, green bean, potato soup." Tina: "Shrimp, Steak, rolls and fresh green beans we got for free! Amazing what the freezer/fridge is hiding...lol!" Finally, as you clear out and empty your freezer and pantry, meal after meal, you'll have gotten rid of older food, reduced your stockpiles, and will be ready to add newer and fresher food to your food storage areas! Look at the results from these participants, who sent in photos of their results. The photos from this collage are from the following readers, first on the left from top to bottom, and then the right hand image, along with any explanation they provided about their photos. Amanda: "I just did this! :D Emptied the food cupboard! Lol. It was PACKED before! I managed to only need to run to the store for basic items that we use on a daily basis. Stuck to a budget of $50. :)"
Deborah: "My freezer has never been this empty. I am so happy." Mayte: "This was my freezer after we ate almost all of its contents, yay us! I went to the grocery store yesterday and stocked up on a lot of things for the pantry and freezer. However, I made conscious decisions about what and how much to buy. I had a list that matched my next three weeks of cooking, which I am learning to do this year. Yes, I never cook, but this year I made a point to learn and have been doing it at least once or twice a week. I can't tell you how excited I am, because I have a "new kitchen" with all the stuff organized and ready to be used. Zen, very zen!" 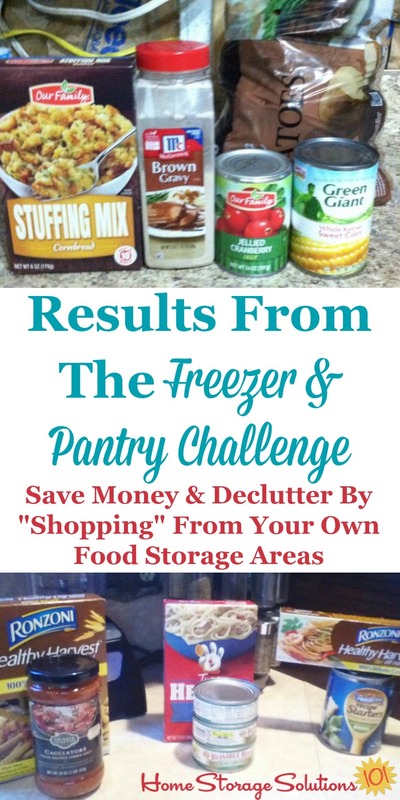 Make Sure You Join The Eat From The Freezer & Pantry Challenge! 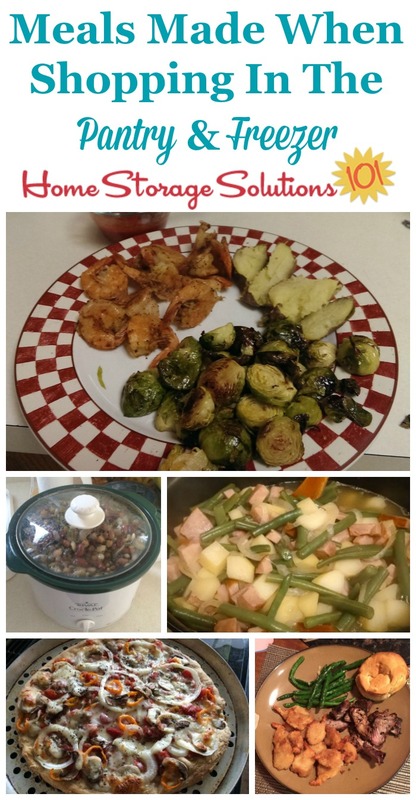 I hope these photos from other readers have made you want to participate, and clear out your own pantry and freezer too! 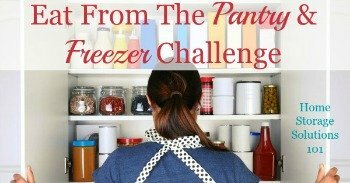 Make sure to come over to the Eat From The Pantry & Freezer Challenge page to read more about how to do the challenge, and to get lots of free printables and other resources that will help you accomplish the task. There are menu planning printables, inventory forms for your pantry and freezer, and more!